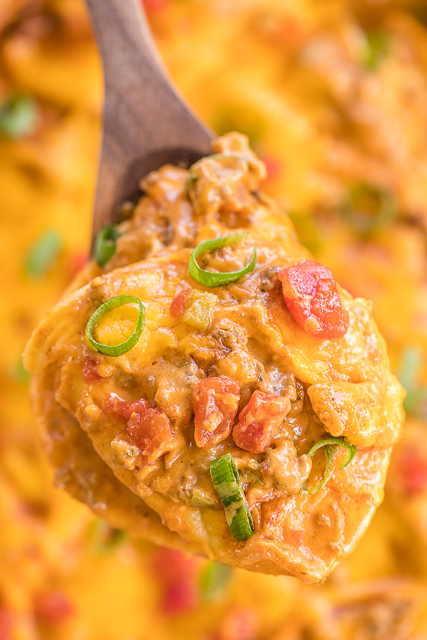 Taco Pierogi Casserole - THE BEST! We ate this two days in a row! Ready in 30 minutes!! Taco meat, velveeta, salsa, cheese pierogies, cream of chicken soup and cheddar cheese. CRAZY good! Everyone cleaned their plates - even our picky eaters! Our favorite Mexican casserole! 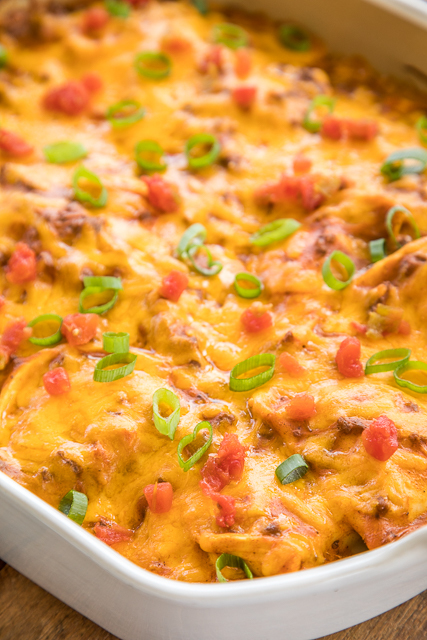 I am obsessed with this Taco Pierogi Casserole. It is crazy good!! Taco meat, salsa, cheese sauce and yummy pierogies. OMG! I wanted to lick my plate. I loved everything about this casserole. All you need is some black beans or a quick guacamole salad and you have a quick and delicious weeknight dinner!!! 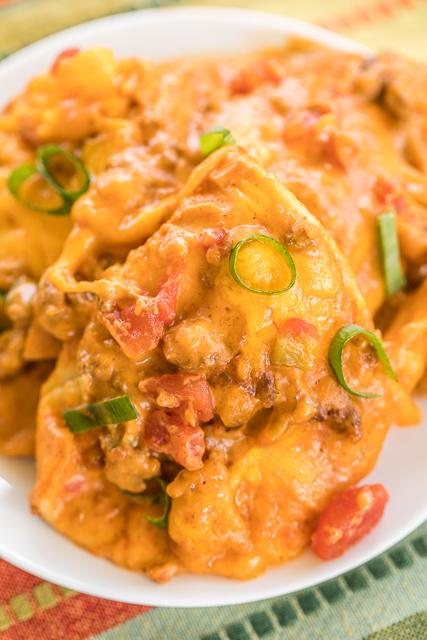 This Taco Pierogi Casserole can be made ahead of time and refrigerated overnight. Just pop it in the oven after work and dinner is on the table in about 30 minutes. I didn't precook the pierogis before tossing them in the meat and cheese sauce. They cooked up perfectly while the casserole baked. This Taco Pierogi Casserole uses a jar of salsa. I used Trader Joe's salsa. If you are serving this to little ones and are worried about the heat, make sure to use a mild salsa. You could also swap out the salsa for some crushed tomatoes and a little onion. 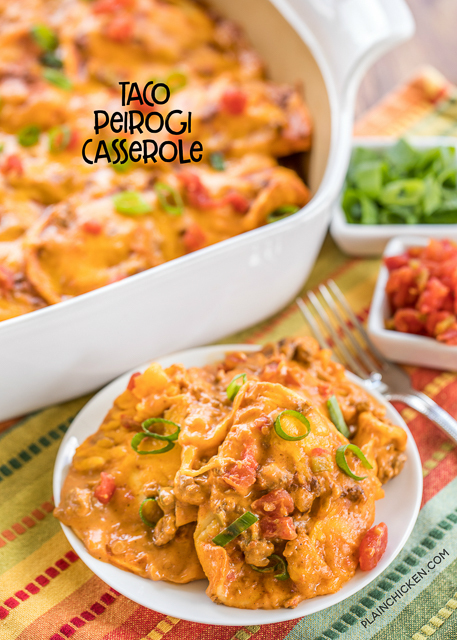 We absolutely LOVED this Taco Pierogi Casserole! We are planning on making it again this weekend. You should too!! It is delicious! Stir in soup, Velveeta and salsa. Reduce heat to low, and cook until the cheese melts, stirring constantly. Stir in pierogies and pour into prepared dish. Top with cheddar cheese. What are pierogis??? Something like tortellini? It is a potato dumpling - you can find them in the freezer section near the frozen potatoes. I made this but converted it to vegetarian by using veggie ground round. I also sautéed in onions, garlic, and a bunch of peppers. It was super good thanks for the recipe!!! !